Y’all, something kind of amazing happened a few weeks ago. A few weeks after launching the Eight in the Chamber Box set I got an email. It was a fairly simple email of introduction and a request: would I be willing to participate in a big box set of Noir-style novels for Story Bundle. Story Bundle is built on the same premise as the original Humble Bundle. Humble Bundle went like this: here’s a bunch of independently developed games you probably haven’t heard of and you tell us how much it’s worth to you. That’s how much you pay. Story Bundle is built in the same vein as Humble Bundle. Here’s a bunch of cool books you probably haven’t read and they’re chosen around a theme. How much is that worth to you? That’s how much you pay. Well, I got that email and I immediately thought “Oh, sure, Scammy McScammerson, you want my book. Hah!” Then I thought, Oh, what if this is for real. This would be a cool thing to be a part of. I better do some research. So, I asked around. I talked to people. Did some reading. What I found is that Story Bundle was legit, and all the people involved had fantastic reputation. I emailed back that I’d be thrilled to participate. So what’s the deal with this Story Bundle? Kate Sullivan, the intrepid founder and once-mastermind of Candlemark, put together a fantabulous StoryBundle of neo-noir speculative fiction. From space opera to swords and sorcery, from horror to urban fantasy, corrupt elves, werewolf cops, ghostly soul-whisperers, and Twitter-obsessed superheroes, it’s all there— just take a gander at that snazzy lineup! Did you see the Concrete Goodbye cover in there? Looks pretty cool, huh? So what’s the deal? Well, like the inspiration Humble Bundle, the Story Bundle costs as much as you think it’s worth. It starts with $5. For that $5 you get Gods of Chicago, Mr Blank, The Concrete Goodbye, Trouble in Double. If you think it’s worth more than $5, you pay more than $5! And that’s because if you go up to the bonus level you can get ALL the titles: Gods of Chicago, Mr Blank, The Concrete Goodbye, Trouble in Double, Green Light Delivery, City of Devils, Deep Space Dragnet, Hard Times in Dragon City, Fresh Hell, The Coconut Swindle, and if you sign up for the Story Bundle Newsletter you get The Tau Ceti Transmutation! How much do you think that’s worth? Well, that’s what you’ll pay! Did I mention that you can set 10% of your purchase to go to charity? Yeah, that’s right, if you buy the Neo Noir Story bundle, you can help make the world a better place. That’s you doing dope stuff. Heck yeah! What are the charities? Two that sit close to home for me. Girls Write Now and Might Writers. What charities are these? Girls Write Now helps mentor girls so they can develop writing skills, leading to a more successful future no matter what path they decide to choose. From young women exploring writing to seasoned professionals practicing their craft every day, GWN is a community of women writers dedicated to providing guidance, support, and opportunities for high school girls to develop their creative, independent voices and write their way to a better future. Mighty Writers’ mission is to teach Philadelphia kids to think and write with clarity. Our free programs combat the literacy crisis in a city where nearly half of high school students drop out and some 50% of working-age adults are functionally illiterate (can’t read bank statements, fill out job applications or easily comprehend news articles). I have volunteered for a writing program like Girls Write now. The one that I worked for was for boys and girls in economically disadvantaged Texas schools to help teach kids how to write. The book those kids produced that year ended up in the George W. Bush presidential library. I know, cool right? Something I worked on ended up in a Presidential Library. But, hey, Story Bundle! $5 gets you Gods of Chicago, Mr Blank, The Concrete Goodbye, Trouble in Double. 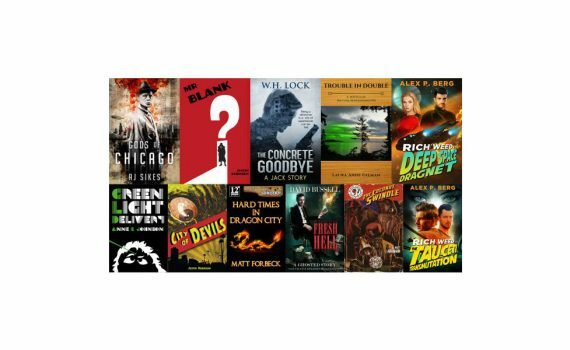 If you go bonus level you can get ALL the titles: Gods of Chicago, Mr Blank, The Concrete Goodbye, Trouble in Double, Green Light Delivery, City of Devils, Deep Space Dragnet, Hard Times in Dragon City, Fresh Hell, The Coconut Swindle, and if you sign up for the Story Bundle Newsletter you get The Tau Ceti Transmutation! If you bought the Eight in the Chamber box set I was a part of you’ll recognize Alex Berg and Matt Abrams. They both had stories in that box set. You pay what you think it’s worth. And you get to help make the world a better place.